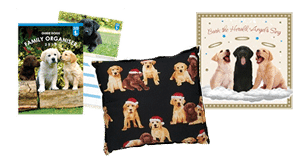 As a charity they rely on donations from supporters like yourself, but if you’re not in a position to give regularly, their gift shop is perfect to buy essentials like Christmas cards and paper, whilst helping this great charity. They even give you FREE delivery when you spend over £45. Alongside their popular sponsor a puppy programme this a great way to get involved with Guide Dogs for the Blind.